A 300 RPM, 24 pole, AC synchronous motor is capable of high torque and quiet operation. The motor is installed in a machined steel housing. The stepped motor pulley for 33-1/3 and 45 RPM operation, has an accuracy of ±0.0005 circumference. 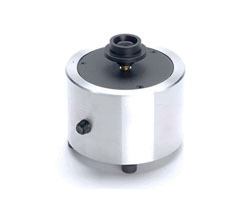 Height to top of enclosure 3.625"
A 300 RPM, 24 pole, AC synchronous motor is capable of high torque and quiet operation. The motor is installed in a separate machined aluminum and steel housing. The stepped motor pulley for 33-1/3 and 45 RPM operation, has an accuracy of ±0.0005 circumference. A 300 RPM, 24 pole, AC synchronous motor is capable of high torque and quiet operation. The motor is installed in a machined stainless steel housing. The stepped motor pulley for 33-1/3 and 45 RPM operation, has an accuracy of ±0.0005 circumference. Height to top of enclosure 4.5"
The picture shows the optional One-Speed Pulley designed for use with multiple belts and requires the ADS for two speed operation. Includes two 300 RPM, 24 pole, AC synchronous motors in a machined aluminum assembly capable of high torque and quiet operation. 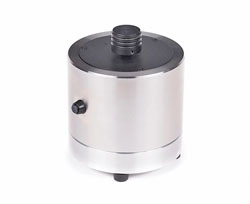 The Rim Drive motor pulley has an accuracy of ±0.0005”. For the utmost accuracy in motor speed and fine speed adjustments. 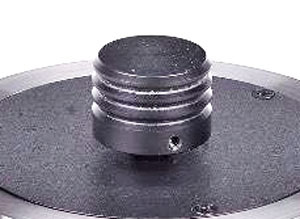 Disc clamping is known to reduce the affects of external vibrations from acting upon the stylus. This action improves minute details and overall sound quality. 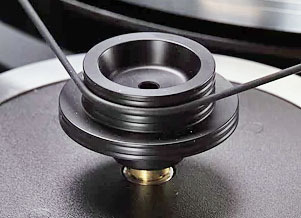 The Delrin Clamp screws onto the threaded spindle of VPI tables to clamp the record. By using the clamping action, you can reduce (and in some cases eliminate) record warps and create a much tighter seal between the record and platter. The Deluxe Clamp makes several key improvements over the Delrin Clamp. 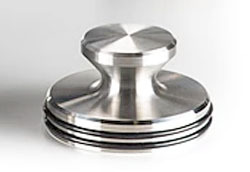 The adjustable knob/upper half of the clamp is machined from stainless steel. 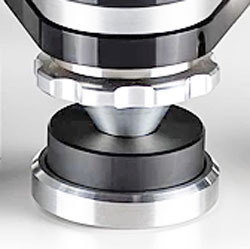 By using stainless steel, the clamp adds even more mass and mechanical damping to the platter. 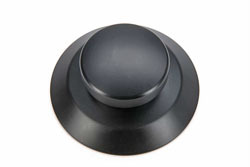 Since the stainless steel knob is more dense, this translates to better warp reduction. 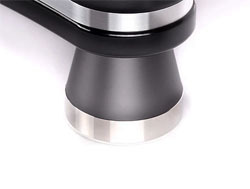 The stainless steel Signature Clamp will work with all VPI tables and other brands as well. 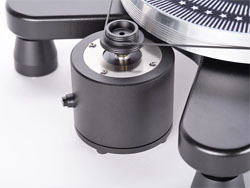 In addition, the Signature Clamp works well in conjunction with the VPI Periphery Ring Clamp which provides vacuum-like hold down without the problems inherent in a vacuum system, for maximum stability of record playback. For the ultimate in record warp reduction. 6061 Aluminum with Oil Bath Bearing. Fitted to shaft with a #2 Jacob’s Taper for a concentric rigidly mounted coupling. The bearing has a PEEK thrust disc and machined graphite impregnated brass bushings using a Thompson Engineering 60 Rockwell case hardened shaft. The Periphery Ring Clamp cannot be used with the Prime Scout platter. 6061 Aluminum with Inverted Bearing. Accuracy of ±0.001” in a 39” circumference. Hardened stainless steel shaft, 60 Rockwell chrome hardened ball, spinning in a phosphor bronze bushing and sits on a PEEK thrust disc. The belt side load is placed at the center of the spinning bearing for zero teeter-totter effects. The Periphery Ring Clamp can be used with the Prime platter and is not shown. The Magnetic Drive System is a unique design utilizing two platters that do not touch each other and allow independent rotation. Each platter has six powerful imbedded magnets that allow the upper platter to partially float above the lower drive platter. Approximately 80% of the upper platter weight is supported by the opposing magnets and 20% of the load is supported by the inverted bearing. The magnetic field of the magnets overlap acting like a gear to transmit rotation power from the lower driven platter to the upper platter without physical contact. Noise, wow and flutter levels are exceptionally low. The magnets are close to the bearing and do not interfere with the phono cartridge. 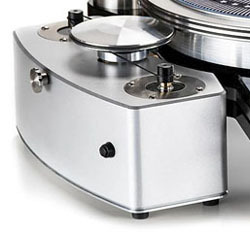 VPI's Magnetic Drive System is the ultimate vibration filter for a high-end turntable drive system. The Periphery Ring Clamp shown is not included in the price and is purchased separately. 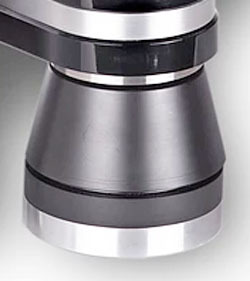 Machined from Delrin, the feet provide isolation from vibration and give the user the ability to easily raise and lower the height to level the table. 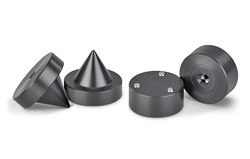 Machined from Delrin, the upper spike and lower base provide isolation from vibration and give the user the ability to easily raise and lower the height to level the table. 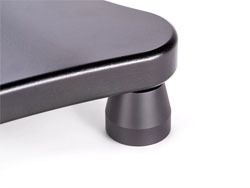 Machined from Delrin and Aluminum, the Signature Feet provide isolation from vibration and give the user the ability to easily raise and lower the height to level the table. Two layers of isolation. 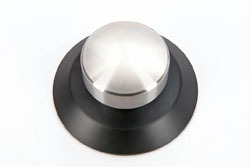 A machined Aluminum cone sets into a machined Delrin isolation pad with damping material. The Delrin pad sets into a machined Aluminum isolation pad with additional damping material for top of the line isolation and noise reduction. The user can easily raise and lower the height to level the table. Each foot utilizes an air bladder to provide ultimate isolation and noise reduction. The user can easily raise and lower the height to level the table.